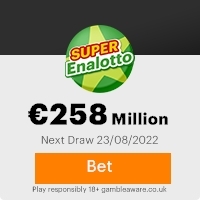 You won the sum of â600,000.00 (Six Hundred Thousand Euros) by E.U Lottery in conjunction with the British American Tobacco Worldwide Promotion, your email was among the7 Lucky winners who won â600,000.00 (Six Hundred Thousand Euros) each on the E.U Lottery promotion. This Lottery is approved by the World Gaming Board and also licensed by the International Association of Gaming Regulators (IAGR). We hereby contact you to claim the winning amount quickly as this is a monthly lottery. Failure to claim your winning will result into the reversion of the winning sum to our following month lottery. (Deadline, 19th of January, 2007). You are therefore requested to contact immediately our approve Claims Agent Department below quoting your winning number: ELO-05220796. Director of E.U Lottery Promotion. This Email with the Subject "From: Mrs. Karlijn Johnson," was received in one of Scamdex's honeypot email accounts on Wed, 03 Jan 2007 06:17:47 -0800 and has been classified as a Generic Scam Email. The sender shows as john@jwilliams79.orangehome.co.uk, although that address was probably spoofed. We recommend that you do not attempt to contact any persons or organizations referenced in this email, as you may expose yourself to scammers and, at the very least, you will be added to their email address lists for spam purposes.